" LUCAS DPA DISTRIBUTOR - TYPE INJECTION "
Distributor pumps are generally lighter and more compact, are less costly, than their in-line counter parts. Also, their governors and injection advance devices are simpler and smaller. This type of pump usually incorporates a transfer pump used for keeping it full of fuel and also for powering many of the control systems. Consequently, transfer pump delivery pressures of up to 785 kPa and above are necessary. 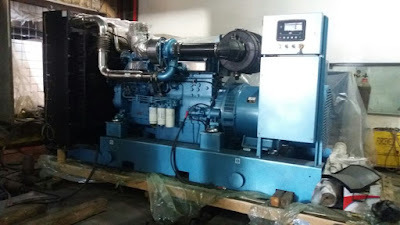 For achieving this pressure, vane type pumps are generally used. Pump Description and Construction of Pumping Unit. This pump uses a single steel rotor, which works as the pumping element and also distributes the fuel. The rotor rotates in a stationary steel cylindrical sleeve known as the hydraulic head. The pumping section of the rotor is flanged and has a larger diameter than the distributor section. It has a transverse cylinder bore to house two opposed pumping plungers. A stationary internal-cam ring is installed in the pump housing and operates the plungers through rollers and shoes, which are placed in slots machined into the circumference of the rotor flange. The cam ring uses as many lobes as there are engine cylinders, and they are evenly placed round the ring. The outward movement of the opposed plungers is controlled by metered fuel pressure. The distributor section of the rotor has a central passage which intersects the space between the pumping plungers. A single radial distributor port is located at the opposite end of the passage. 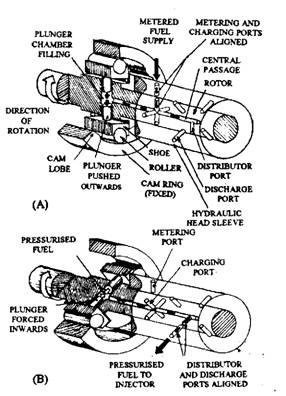 During rotation of the rotor this single distributor port aligns in turn with each of the discharge ports, radially located round the hydraulic head. These ports are connected to high-pressure pipes joining the pump to the individual injectors. the hydraulic head. This port provides the metered fuel to the rotor to pressurise and to distribute. Fig. 10.26. Lucas DPA (CAV) distributor-type injection pump is at the opposite end of the passage. 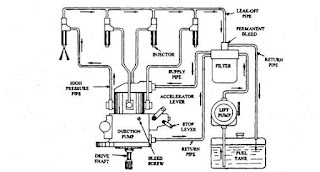 Initially the fuel is pumped by the lift pump and is delivered through the filter to the regulator-valve end plate (Fig. 10.26). 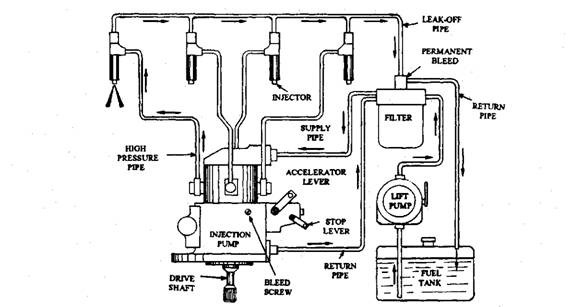 Fuel first flows through the vane transfer pump, screwed on to the end of the rotor so that the fuel pressure is increased according to the speed of the rotor. 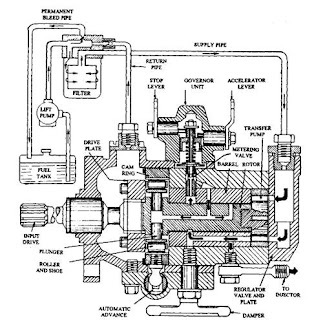 The fuel then flows along a passage in the hydraulic head and around an angular groove to the metering valve so that it flows to the metering port to enter the rotor. Rotor and Plunger Pumping Action. flows into the element during short period of the alignment of the metering and charging ports, determines the extent of outward displacement of the plunger. Fig. 10.27. Cycle of Operation. A. Charge phase. B. Injection phase. In the injection phase (Fig. 10.27B), rotation of the rotor misaligns all charge ports with the metering port, but it aligns the distribution port with one of the discharge ports in the hydraulic head. Simultaneously, both rollers contact the flank of diametrically opposed cam lobes, which force both plungers together. The generated high pressure in the fuel then forces it out through the discharge port and consequently to an appropriate injector. Fig. 10.28. 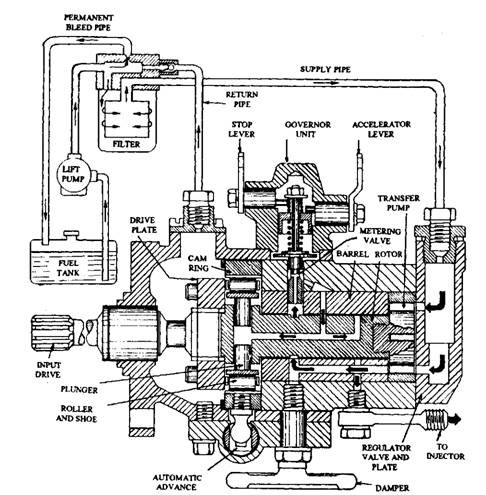 Fourrcylinder DPA injection pump cycle of operation. 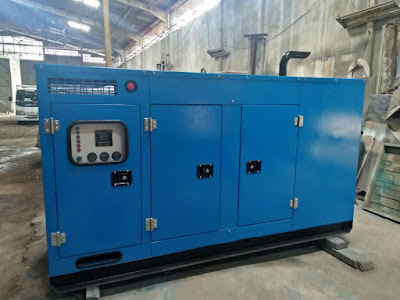 The cycle of event is similar with a four-cylinder distributor (DPA) injector pump. There is still one pair of opposing plungers, one metering port, and one distributor port. But in this case there are four cam lobes, charge ports, and discharge ports. A charge or discharge event takes place at 90 degree interval of the rotor (Fig. 10.28). Each cam lobe develops two peaks, and injection ceases when the roller reaches the first peak, the higher one. The valley between the two peaks causes a rapid reduction in pressure in the injector pipe, preventing dribble and carbon formation at the injector nozzle at the end of the injection. The second peak prevents complete collapse of the pipeline pressure for a period enough for the distribution port to be cut off from the dis­charge port. Residual pressure is then maintained in the pipeline between the discharge port and the injector. Usually no delivery valve is necessary with this cam profile. Note : Copas Book NN.